2nd Amendment Advocacy Group, Cold Dead Hands, announces their first political endorsement in TJ Fabby. Billing themselves as a "New Breed of Advocacy", Cold Dead Hands has been quietly growing on social media and has begun to take their advocacy into many areas. Education being their primary focus thus far, with the sponsorship of junior shooters as role models for younger generations through Team CDH and the recent launch of their F.A.S.T. program aimed at college students. However, as we move deeper and deeper into election season, their focus has shifted towards an educated electorate and they have been doing their due diligence there as well. Operating on the "all politics is local" philosophy, the Cold Dead Hands leadership has focused on Texas politics. Texas, although it has a very pro gun rights reputation, is actually closer to New York and California when it comes to restrictions on firearms. In conjunction with Texas Firearms Freedom and other organizations, Cold Dead Hands sought out a candidate that they could officially endorse that represented their views, the views of their followers and most importantly the views of a growing majority of Texans. 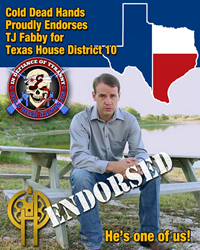 After extensive vetting, attending fund raising efforts and an extensive and unconventional interview they have announced their first official endorsement for TJ Fabby running for Texas House District 10. However, their endorsement was not a single issue endorsement, but rather an endorsement of his Constitutional Conservative positions across the board. According to their endorsement announcement, "In short, he fills the bill of a Constitutional Conservative with his belief in a small government, individual liberty and the principles of God-Given Rights that this nation and Texas were founded upon." Their endorsement took on a much more personal than many typical political endorsements, perhaps due to their very hands on form of advocacy, "TJ Fabby is Texan through and through, he loves the state, the people and the independent spirit that is Texas. His love of that independence showed in all of the topics we discussed from taxes, to federal regulation to Constitutional Carry in Texas. His focus is squarely on individual sovereignty and state sovereignty." This being their first official political endorsement, it remains to be seen how much weight it carries, but according to Patrick James (founder of Cold Dead Hands), "We have to protect and reclaim our freedoms and liberties one politician at a time, and TJ Fabby is one step closer to that goal." Cold Dead Hands (CDH, Inc.) is an unapologetic for-profit corporation and an American grassroots movement created as a new breed of advocacy that fully embraces all that is American. Free market capitalism, freedom of association and limited government are the foundational pillars that support the advocacy goals of Constitutional Carry in accordance with the 2nd Amendment, responsibility of gun owners/voters/individuals and education related to firearms, politics and society.